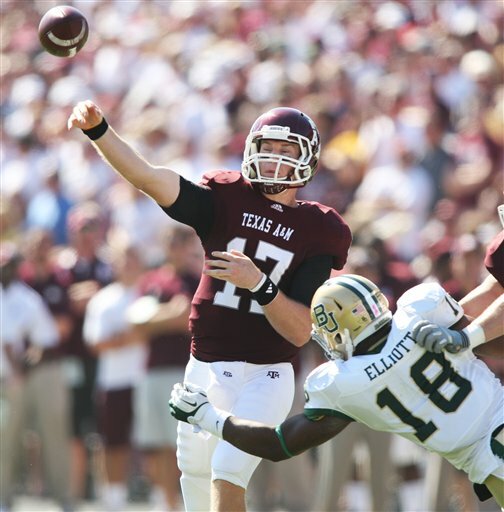 Ryan Tannehill started 19 games at Texas A&M. I watched six of them, all from his senior season in College Station, Texas. Given his lack of experience at the quarterback position (only six starts to end his junior year), my evaluation was chronological. I was anxious to see how he progressed as he played more snaps and gained a greater feel for the subtleties of the position. I began with Oklahoma State, A&M’s first conference matchup in the Big 12. It was the Aggies’ third game of the season, after consecutive easy wins against non-conference teams. Remember, at that early point in the season, no one knew with any certainty that Oklahoma State would be a contender for the national championship. Quite frankly, that was not that relevant to me. When I study a quarterback, I am not overly concerned with the opponent. In addition, I don’t spend a lot of time analyzing the specifics of his college offense. That’s only important in one sense: You get a feel for what he’s asked to do, and then you can analyze his reads and throws accordingly. Think of it this way: If you based your evaluation of Cam Newton a year ago on the mechanics of Auburn’s run-first option offense, then you would have missed the more essential evaluation — that Newton was a special talent as a passer. When I watch coaching tape of a college quarterback, my focus is on the attributes of quarterback play that are necessary to succeed at the position in the NFL. Passing the ball well on Sundays demands particular and identifiable traits. There’s no question different players possess these characteristics in distinctive and varying degrees. The overriding point, however, is that consistent quarterback play requires a tangible skill set that can be quantified. 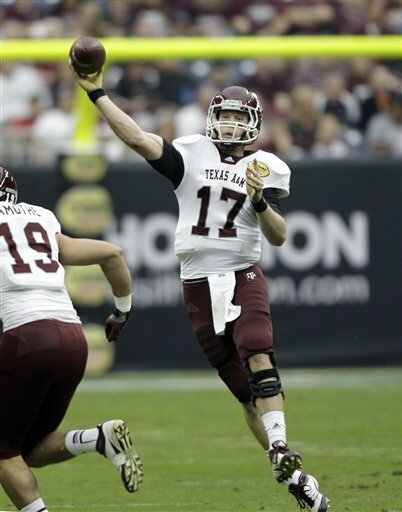 Back to Tannehill — against Oklahoma State, a number of things were evident. Let’s start with arm strength, often dismissed as an overrated attribute — until, of course, it’s needed in a critical situation. Tannehill had a good arm, but not a gun. What helped him spin the ball was good weight transfer. He did not lift his back foot off the ground too soon, and effectively drove through his throws. Three other points emerged from this game. First, he was willing to pull the trigger on difficult throws, which is a necessity in the NFL. Second, he threw the ball well and with confidence when working outside the numbers. Lastly, and surprisingly given his relative inexperience, he exhibited comfortable pocket mobility. In response to pressure, he moved within an area that approximates the size of a boxing ring while maintaining both his passer profile and his downfield focus. Pocket movement is a far more important attribute in the NFL than leaving the pocket and running. This was one game, so these were snapshots more than final grades. As I continued with Arkansas, Iowa State and Missouri, I developed a more fully developed picture of Tannehill. His delivery was a bit low, more three-quarters than over-the-top. It was compact with good arm speed, which also accounted for the aforementioned velocity. One concern: I thought he had a tendency to lock his front leg as he delivered the ball at times. There were instances in which that hindered his usually precise ball location. Some throws were a little high, especially ones between the numbers. Those problems can be coached and fixed, but it’s a process and, at this point, a concern. One benefit of Tannehill’s three-quarters delivery is it allows him to throw very well on the move, both to his right and impressively, to his left. In fact, he’s a better, more accurate passer on the run than either Andrew Luck or Robert Griffin. Tannehill was very efficient off the boot-action pass game. That will translate very well to the NFL. 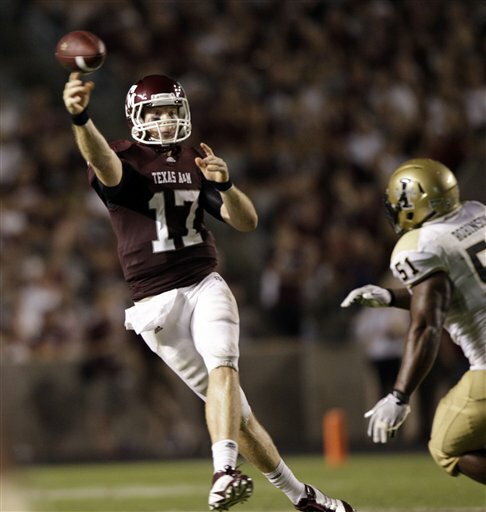 The final two games I evaluated were Texas A&M’s contests against Oklahoma and Texas. Pocket movement remained a strong element of his game. I would argue that Tannehill exhibited the best pocket command and mobility of any quarterback in this draft class. To take it a step further, Tannehill was very good when improvising within structure. When the pressure forced him to abandon the boxing ring, he did, but the objective was again to find a quieter area to deliver the ball rather than to run. While the threat of the run was present, Tannehill remained a passer first, allowing the defense to dictate his reaction. We always talk about extending plays. Tannehill did that well, preserving his downfield focus and making accurate throws at the intermediate and deeper levels of the defense. Some inconsistencies in his play also appeared. He did not drive the ball as well against Texas as he had in the earlier games. He missed some throws that were there; overall, his ball location was inconsistent. I am not ready to say it’s a red flag as he transitions to the NFL, but it is something to watch, especially with his tendency to lock his front leg. One other problem became increasingly evident the more plays I watched. In every pass offense, the quarterback must locate the safeties to best determine where to throw the ball at the intermediate and deeper levels. Tannehill at times did not do a good job of verifying the positioning of the safeties after the snap of the ball. That led to some poor reads and ill-advised throws, especially against Texas. As I mentioned earlier, that can and will be fixed through coaching in the context of his NFL pass offense. Overall, I did not necessarily see the kind of improvement over time I would have liked. In the final analysis, Tannehill is a better prospect than Christian Ponder was a year ago. Tannehill possesses the skill set to be a quality NFL starter. At this point, he would be best in a quick-rhythm, short-to-intermediate passing game that featured play-action and boot-action passes. One thing we know for certain: He likely will be drafted higher than his body of work suggests he should be. For more of Greg Cosell’s observations, follow him on Twitter @gregcosell.